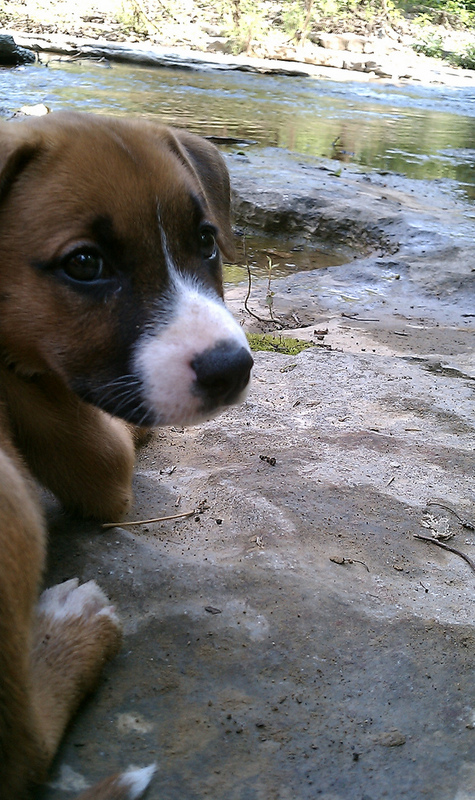 Do you know that all I want to do these days is sit near a lazy Tennessee creek with this borrowed Boxer-mix puppy? Is she not heaven? The creek is a few miles from us and runs through the front property of a friend’s house — same friend whose house was flooded in May when this little creek turned raging river. Our own puppy, Buddy, is currently stuck at home with a cone on his head to keep him from licking his nethers. You see, he got the snip snip this past week. Buddy is doing fine and in defense of his manhood, I have to report the vet told me his parts were impressively sized for a small dog. I told her that is probably why he is such a big pain. I know how to pick them, I tell you. I’m linking this post to the Unknown Mami’s Sundays in My City series. She’s in San Francisco and the links she gets from other bloggers are pretty awesome. Thought I would show off the glory that is my little country Tennessee town to all those big city folks. Go look. Tags: Hot links, Viva Nashville! Adorable puppy… such sweet eyes! I grew up in Tennessee, and love those mountains creeks. Thank you for making me laugh with your posting!!! Your mommy is so funny!! We’re in North GA, so we love Tennessee! You’re right, that is one cute puppy! Hope Buddy is on the mend and ready for a trip to the creek soon. OMG Is that not the cutest pupper? How sweet! And I hope Buddy is up and at it again soon! I hope Buddy is out of the cone soon. Your mom is hilarious. What an absolute cutie! Hope he simmers down for you. Doesn’t matter – I like both blogs! Sunny SIMC greetings from Casablanca! You and mama are way too funny! Hope he is doing better!